The League of Women voters prevent women from voting in Florida. How ironic. The Florida Supreme Court yanked the measure citing it didn’t include the words “charter school” in the language on the part of the referendum dealing with permitting the state to establish schools. 3:10 Public Service Announcement from Jack Abramoff former lobbyist on why lobbyists hate term limits. In 2006, Sentenced to 6 years in federal prison for mail fraud conspiracy to bribe public officials, and tax evasion, autobiography “Capitol Punishment” and “Casino Jack” in 2010 starring Kevin Spacey. View Jack Abramoff video on youtube. 5:20 Former Governor Quinn “Take Charge Chicago” Thrown off the ballot by Electoral Board. Collected 86K signatures. Wasn’t confusing or misleading. They may only have three referenda on the ballot that the council put on the ballot when they saw the term limits initiative was picking up steam. They put extra questions on the ballot to knock off the term limits citizen’s initiative. Instead, the voters will have a change to decide whether or not plastic straws should be banned. Pat Quinn Democratic Governor in the ’90s has a long record of being a proponent of term limits. In 1994 lead effort: 8 is enough initiative but Supreme Court of Illinois threw it off the ballot. 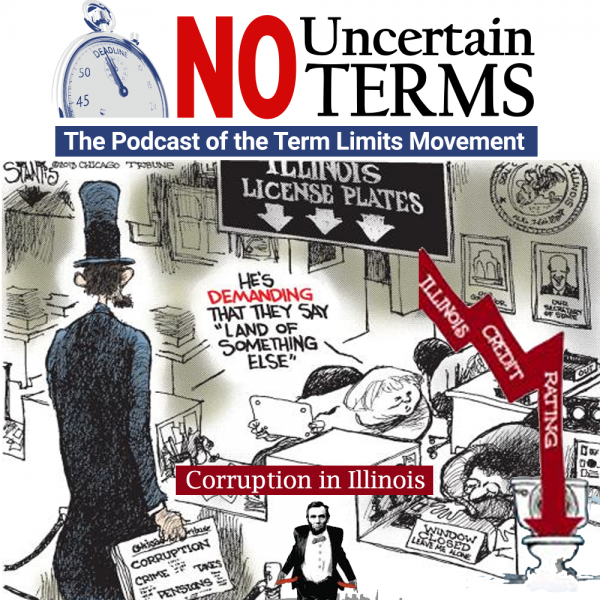 The current Republican Governor of Illinois, Bruce Rauner Republican Governor spearheaded an initiative to put term limits on the ballot and the Court found new reasons to take it off the ballot. Illinois is one of the worst run states in the nation but has the most experience in Madigan… longest serving state legislator in history. In this election cycle there are three Democratic women candidates ran ads in favor of term limits. Laura Ellman, Ann Gillespie and Bridget Fitzgerald. Didn’t sit well with Speaker Madigan. The Chicago Federation of Labor said they would withhold $5million in campaign funds unless the ads were pulled. They were pulled. The people know they need term limits but the machine comes down on anyone who opposed them. State legislative pledge to cosponsor and vote for term limits article v 280 signed. 186 still going into the general election. 97% of incumbents win elections. It’s normal in Illinois for half the seats unopposed. In Illinois the committees are simply rubber stamps to party leadership. We already have term limits, they’re called elections. No you don’t. Half the seats are uncontested. With term limits, party leadership will be constantly rotating. Chris Mooney, University of Illinois, The most profound effect of term limits will be removal of the centralization of power. By ousting these, term limits. 20:45 Nicolas Tomboulides Is Your Member of Congress on Alzheimer’s Medication? Does Congress Have a Dementia Problem?